(1) Who do I want to make my medical, legal, and financial decisions for me in the event that I am alive but unable to make decisions for myself? (2) What happens financially when I die (i.e. what happens to what I own, what happens to what I owe, and what happens about life insurance)? (3) What end-of-life medical decisions do I want to make for myself now so that my loved ones can follow my directions later (e.g. do I want to donate my organs, do I want to be kept on life support etc.)? 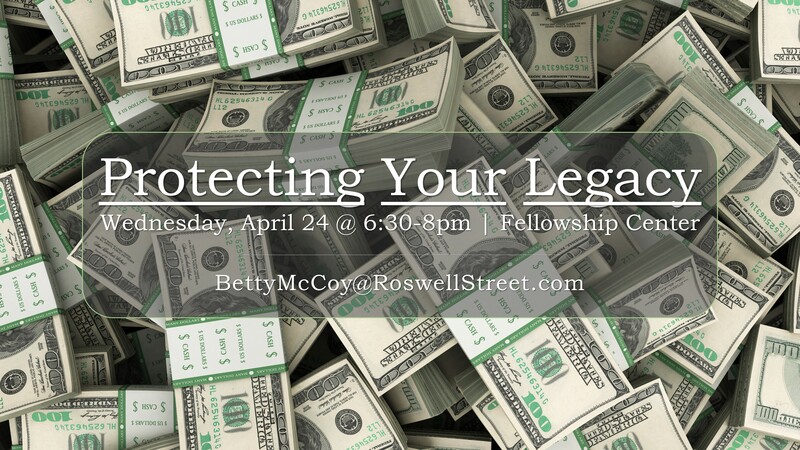 Registration Required for this Free Seminar with featured speakers: Representative Sam Warner from GA Baptist Foundation Eric Matthews, Merrill Lynch, John C. Leggett, Attorney, Leggett Law, works in affiliation with the Georgia Baptist Foundation. Take advantage of this free seminar and you will be given the opportunity to make an appointment with an experienced and competent lawyer who can assist you with any of these documents at a greatly reduced cost (Last Will and Testament, Living Will, Health Care Surrogate Designation, Durable Power of Attorney). Dinner free to registrants (served 5:15–6:00pm in the Fellowship Center).